Haldiram Nagpur is an iconic Indian brand it is popularly known for superior quality sweets. 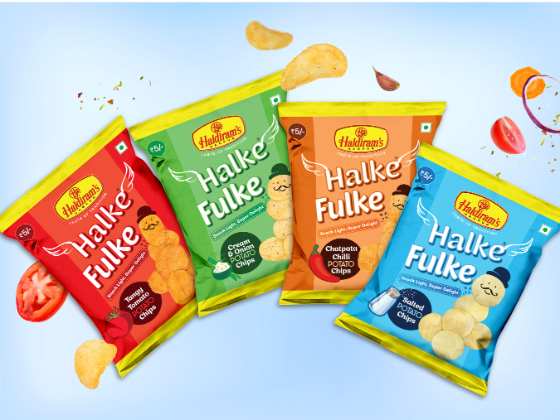 Over the years, the brand has expanded into various other kinds of snacks popular among Indians. Halke Phulke product line by Haldiram's are potatoes chips oozing with rich flavors of tomato, mint (pudina), chili and plain salted potato. 'Halk phulka' is a popular phrase among Indians to describe that they wish to eat something light. 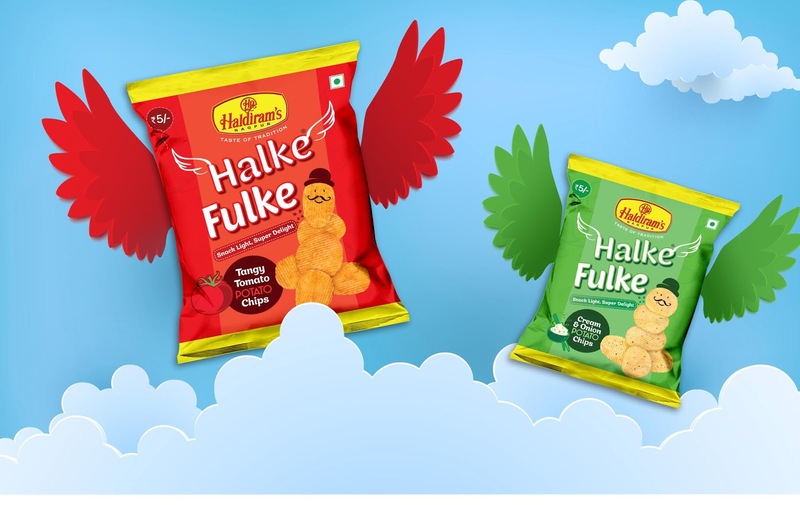 DesignerPeople used casual fonts fixed with wings from either side of the product name to visually convey that these snacks are 'light' or halka phulka snacks that can kill the hunger at odd hours between the meals. DesignerPeople chose mono-color schemes to set the background closest to represent respective flavors. Peppy colors were used to highlight the product name, brand name and other important details of the product. The overall color scheme is simple, appealing and intrigues the potential buyers to learn more about a product by the iconic brand they can easily relate to.